The father of Australian "Crocodile Hunter" Steve Irwin has spoken out against a state funeral for his late son being offered by the government. 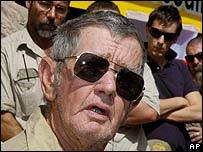 Bob Irwin said the popular naturalist had been an "ordinary bloke" and would not have wanted a grand funeral. 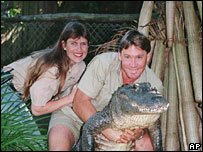 However, Mr Irwin added that the final decision on the matter would be made by Steve's widow Terri. The TV star died on Monday in a stingray attack while filming sea creatures off the Australian coast. Speaking to reporters outside his son's zoo in the north-eastern state of Queensland on Wednesday, Bob Irwin thanked all those who have been paying their respects. But he made clear that if it had been up to his son, a state funeral would have been refused. "He's just an ordinary bloke, and he wants to be remembered as an ordinary bloke," Mr Irwin said. Australian PM John Howard and other leaders have said Mr Irwin can have a state funeral if his family requests one. So far Terri Irwin has not responded to the offer. On Tuesday she spoke briefly over the public address system at the zoo. "It was very brief. She was very choked up," a zoo spokesman quoted by the Associated Press news agency said. The spokesman said Ms Irwin thanked the staff for their support. Zoo workers have been astounded by the number of messages and condolences they have received and the entrance to the zoo is now said to resemble an impromptu shrine. "We are still in shock, but it's great to see so many people coming to show their support," a zoo spokeswoman told the AFP news agency. "It's incredible the impact that Steve had on people's lives around the world," she said. One of the notes left by mourners at the zoo read: "Crikey! We will miss you" - echoing the exclamation Mr Irwin would utter when confronting dangerous wild animals on camera. Mr Irwin was regarded by many Australians as a national treasure and as news of his death broke, news websites across the country found it difficult to cope with the demand for information. Meanwhile his manager has said film footage of the ebullient TV naturalist's final moments should never be shown. The tape was currently in police custody and should be destroyed, John Stainton told the CNN television network. The tape apparently shows Mr Irwin pulling the barb left by a stingray's tail from his chest moments before his death. "It should be destroyed," Mr Stainton said. "When that (tape) is finally released it will never see the light of day, ever. "I actually saw it and I don't want to see it again," he said. Would you watch the video?